Todd L. Wilcox, 54, of McArthur, passed away on Wednesday, March 27, 2019, at his home. He was born on June 3, 1964, in Nelsonville, Ohio, son of the late Viola Wilcox. Todd was a member of the Hamden United Methodist Church and was a former employee of Superior Hardwoods of Wellston. He was a very “strong-willed”, hardworking man who was quite kind and would help anyone in need. 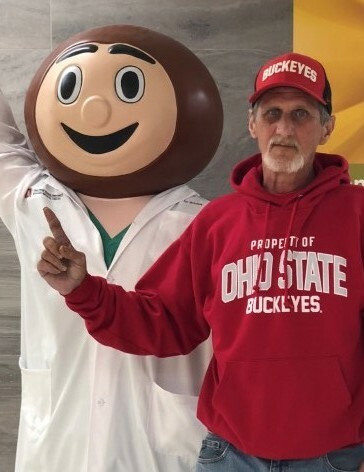 He enjoyed raising chickens, and woodworking in his spare time, but most of all he was a huge Ohio State Buckeyes football fan. Go Bucks! He is survived by his loving family: wife, Brenda; daughters, Lauren Wilcox and Jennifer (Jeremy) Sheets; son, Cain (Laura) Crego; grandson, Noah Sheets; brother-in-law, Mike Layton; sisters-in-law, Sandra Davis and Connie Roberts; as well as several cousins. In addition to his mom, Todd was preceded in death by his brother-in-law, Jeff Layton; sister-in-law, Marylin Layton, and his father and mother-in-law, Alva and Gladys Layton. A funeral service celebrating Todd’s life will be held on Monday, April 1, 2019, at 1:00 p.m., in the chapel of R.M. Williams Funeral Service, 120 W. Broadway St., Wellston, with Pastor Dan Smith officiating. Burial will follow in Elk Cemetery, McArthur. The family will receive friends at the Funeral Home on Sunday, March 31, 2019, from 2 to 5 p.m. Please visit www.rmwilliamsfuneralservice.com to leave a message on comfort, encouragement, or condolence to the family or to view Todd’s online video tribute. R.M. Williams Funeral Service, Wellston, is honored to care for Todd and his family during this difficult time.